Mt. Azami gnawed away at my conscience like a caterpillar on a sakura leaf, but opportunities for a rematch did not present themselves until Paul and Josh came to inquire about another trip. Seizing the chance to revisit the area, we marked off a weekend in mid-May and hoped for more favorable conditions from both the weather gods and the intestinal deities. Paul missed his connecting train, so after a bit of a hiccup we once again met at Haibara station and headed to the same supermarket as the previous year to stock up on supplies. This time we added instant noodles for reinforcements in case the curry packs didn’t work their caloric magic and just around 11am we reached the trailhead parking lot, which was even more packed than our first trip. Trails tend to be much easier the second time around, as we knew what to expect. The water crossings did not pose any problems, but Paul’s slight head cold did slow our progress a bit. He looked a little worse for wear, but we encouraged him as best we could under the stellar sunshine and pleasant breezes seeping down from the ridge high above up. It took only an hour to reach the water source just below the grassy plateau. Josh pushed on to scope out possible camping options – we’d do anything to avoid the mayhem of the large hiking groups. I sat with Paul as he gathered his remaining reserves of energy for the final rise to our sheltered lunch spot. We sat under the open-air shelter, the same one we had used the previous year to prepare our meals. Josh informed us that there were plenty of shaded camping spots in the beech forests on the northern slopes just off the abandoned ski runs. Lunch was devoured in near-record time as Paul collapsed on a grassy slope for a bit of a rest. We were really starting to worry about him and encouraged him to have a proper nap once we had set up camp. In the forested reaches of the plateau, camping parties were dotted at pleasant intervals – not too close for comfort this time around. There was plenty of space to go around but completely flat spaces were few and far between. Luckily this time I opted for a simple canopy in lieu of a proper tent, so I found the perfect grassy niche and dropped my kit there as a reminder of other parties not to get too close. Josh and Paul set up nearby while I gathered stones for our fire pit. Once set up was complete, Paul collapsed in his tent and could hardly move. He was done for the day, and we could only hope his condition would improve after a bit of shut-eye. Josh and I strapped on the day packs and hit the trail in high spirits. We only made it about 20 meters out of camp before running into another hiking party with one familiar member. “Wes?”, came the voice. I turned around and stood face-to-face with Yukako, a woman who had joined our last gathering back in the autumn. She introduced me to her hiking companions before we parted ways. Dreadfully, they were headed down that same day after a morning ascent of Hinokizuka. It would have been nice to share our campfire with a group of cheery bright-eyed Osakans, but it was not to be. From the plateau, the path skirts the edge of the abandoned ski fields until reaching the summit of Maeyama. From there, it was a pleasant walk along the undulating ridge glistening with fresh greenery and vibrant moss. The cooler temperatures this spring had kept the snakes at bay as well, so things were definitely going our way. It took about an hour to top out on Azami’s rocky perch, whose exposed summit afforded spellbinding vistas of Odai-ga-hara and the Omine mountains. The afternoon haze reduced visibility somewhat, but it sure beat the drenching rains and thick fog that would’ve blotted out the views had we attempted this mountain the previous year. It took nearly the same amount of time to retrace our steps back into camp, where luckily no one else had encroached our space. Paul was just beginning to emerge from his afternoon comatose, looking and feeling much better. They got started on the campfire while I set up my shelter. I had recently bought this shelter from Locus Gear and was keen to give it a test run. Not expecting any morning dew or fog, I opted to go without a sleeping bag cover and just use the bug net for protection against the mosquitos. Settled around the fire we soon became, munching down on chickpea curry and chunks of french bread. Josh cracked the beers like a high school kid on his first outing, his drunken monologue leaving us in stitches until he passed out after retreating to his tent to fetch something. With the full moon now risen, Paul and I headed out to the plateau to shoot the night scenery. Morning came calm and clear, with more glorious sunshine and nary a cloud in sight. We cooked up breakfast and coffee, which set my bowels in motion again. I retreated further uphill, digging a hole next to a downed tree and deposited my load, only to find that I had misplaced my toilet paper. I was pretty sure that I had brought it with me when I came up there. I frantically searched all around before limping into camp to borrow some tissues from Josh. By the time I had made it back to the toilet there were literally hundreds of black flies devouring my excrement. Since Paul felt a bit better, we embarked on a morning excursion to the summit of nearby Mt. Kunimi which, at 1420 meters above sea level, sits higher than Mt. Azami. The steep climb took about 30 minutes to reach, so we continued along the ridge for another hour or so until reaching the shores of an idyllic, cordiform pond that would surely be packed with star-crossed lovers if the forest roads had made it this far north. It was hard not to be happy with such remarkable scenery and cooperative weather patterns. We continually had to remind ourselves that we were still in the Kansai region and not strolling along a swooping ridgeline in Nagano. Once back at camp, we cooked up noodles for lunch and broke down the shelters before dropping back down to the parking lot. Could Myojin-daira possibly be Kansai’s best back-country campground? Both visits have been impressive to say the least, but such bold conclusions could not be made with some sort of comparative analysis. Perhaps next year the three of us will head to the Omine mountains to see how it measures up to Myojin’s laid-back vibe. Late July seemed like a really great time to start section hiking the Takashima Trail. The long-distance path follows the Japan Divide through some of Kansai’s most rugged and varied scenery. The path starts at Kunizakai kogen snow park, climbs up the ridge and undulates until reaching Mt. Norikura, the first of 12 peaks along the 80-km trail. From there it’s a series of abrupt climbs and steep ascents along the saddleback ridge until reaching Mt. Akasaka, where I could descend to Makino kogen for a hot bath and ice cream. A quick scan of the weather brought a favorable high-pressure system, so after a fitful sleep with a wriggling toddler, I loaded up the pack and caught the 7:45am train from Osaka to Makino station on the northern reaches of Lake Biwa. Somewhere between Osaka and Kyoto it occurred to me that I might have forgotten my memory card for my camera. I shuffled through my pack and confirmed my fears. At Makino station I alighted and walked down to the beach to the nearest Family Mart, but unfortunately they did not carry any memory cards. Perhaps the manager was a bit old-fashioned, as packs of Fuji 400 speed film lined the shelves where the usual store would stock their digital camera supplies. I retreated back to the station and searched in vain for a coin locker to deposit my camera, but there wasn’t much at the station aside from an attendant with too much time on his hands. Rather than leave it with him, I opted to just carry it as dead weight, as I could use the extra kilograms to work out the thigh muscles. The bus dropped me off at the gated entrance to Kunizakai, whose massive parking lot lay empty and the rest house and restaurants boarded up for the summer. The place was utterly deserted, as if everyone had gone on vacation. The ski lifts fan out in a finger-like way, and with no signposts in sight, I opted to head in the pinkie direction, if the ski resort was left-handed. I made it about 100 meters into the bunny slope, just before the black diamond run merges with the main course on my right. I was standing just below the toilet block, on the green slopes of the following map, when I first caught sight of it. A black bear made its way down the black diamond run gracefully, with a steady yet smooth rhythm, crossing the path directly in front of me, no more than 50 meters in front, to be exact. It paid me no heed, as it was too preoccupied with crossing the field to get to the cool, comforting waters of the mountain stream, which flowed with a trickle on my left. The beast looked lean, as if it had been a while since its last good meal. Not wanted to tempt it with fresh flesh, I retreated back to the boarded up rest house and sat in the shade. 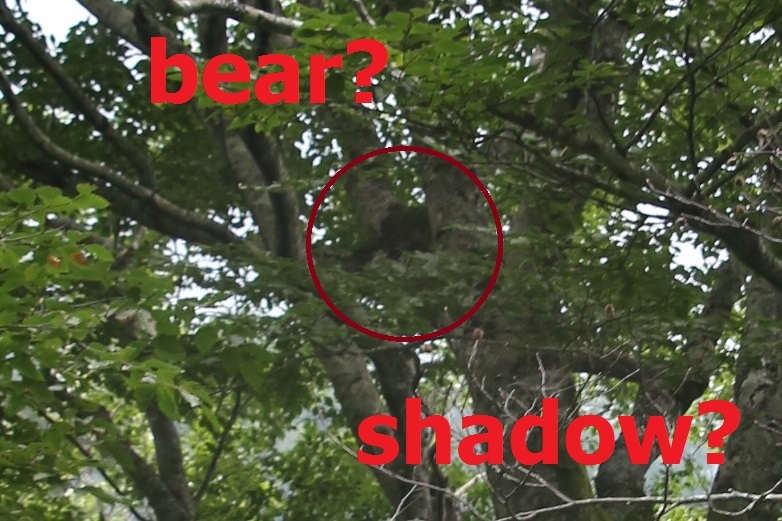 My heart was racing, not because of the encounter with the bear, but with the regret of not bringing my memory card. I’d been waiting to see a bear up close for years now, but with no proof, there’d be nothing but doubt from my friends. A police sketch of the culprit has been issued in lieu of photographic evidence. On the train ride earlier, upon finding my forgetful error, I joked to myself that I would probably see a bear on my hike today, not realizing that it would actually happen, and so close to the trailhead no less. I pulled out the map and discovered that the trail to Norikura actually begins towards the index finger of the snow park. Perhaps the bear just came out to remind me that I was indeed going on the wrong direction. The next bus wasn’t for 3 hours, and the chances of encountering that exact same bear were pretty low (unless I were to take a dip in that mountain stream). Without a camera to document the proceedings, I made quick work of the ski runs, reaching the top of the highest lift in a heap of sweat and exhaustion. I pushed on, bushwhacking through the dense, overgrown forest until popping out on the real trail just a few minutes later. The trail ascended through a healthy beech forest with a smattering of claw marks on the larger trees. I set a turnaround time of noon in order to catch the 1:22pm bus back to Makino. Traversing all the way over to Mt. Akasaka without a camera seemed like an exercise in futility, so I compromised by deciding on an up-and-back of Norikura as a recce for a future section hike in a cooler time of year. The path was easy to follow, and once on the ridge the vistas opened up towards the mountains of Gifu Prefecture, hidden in a haze of smog and cloud. Hakusan would definitely be visible from here on a clear day, and the views down to Lake Biwa are some of the best from any mountain in Shiga. Occasionally a breeze would blow in from the north, helping to evaporate the sweat accumulating on my back. I was starting to overheat, but decided to push on without a break until reaching the summit. The top was marked by a concrete bunker that looked more like a storage tank than any welcoming accommodation. The door was bolted shut, so there was no chance of peeking inside. My clock read 12:15pm, a little later than planned but I knew the descent would be much faster than the climb up. I broke out the frozen Aquarius sports drink I had bought earlier, and used the thawed bottle to help cool down my neck, face, and forehead. I forced down a salted rice ball in order to restore the saline balance and started back down the path after pausing for only a few minutes. The return journey took just 30 minutes to reach the top of the lifts, where I kept a vigilant eye out for that bear. It did not return and I made it down to the bus stop with 10 minutes to spare before the bus.